If you never got any of Art Asylum's C3 Minimate sets, then their new DC Minimates are great - you can get whatever you like without a second thought. Those of us who bought the C3 sets, however, have to weigh the options carefully. Obviously wanting to hit the big characters right away, AA gave us plenty of C3 Batmen, and he's appeared in Series 1 and Series 3 of the new two-packs, as well. 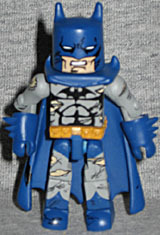 Before you buy, you have to ask yourself whether you need another blocky Batman. The Series 1 Batman (paired with a block-figure version of OMAC) is a plain version in blue and gray, so at least that color scheme is new for the Minimates. However, the Series 3 version is worth getting even without costume semantics. Since he's just a normal human, Batman gets kicked around a lot. This Minimate duplicates that really well, giving us a Battle Damaged Batman. He's still wearing the blue and gray costume, but it's also been painted with various tears, smudges and scrapes. The damage is all over, too - not like Mattel's exclusive version. Arms, legs, chest... even his cowl and the back of his cape show evidence of battle. That's a really good attention to detail! One new feature for Batman is the cowl. On the previous Minimates, the mask was a separate piece with a cutout for the mouth to show through. It's still a separate piece that fits over the head, but the exposed face is now painted on. This is really a good change - it used to be that even a slight mis-application on the actual head would keep things from lining up properly. By putting the face on the mask, they avoid that problem altogether. Batman has two accessories. One is a piece to serve as his hair when the mask is off, and the other is a pair of batcuffs that will fit around the other Minimates' wrists. The holes are a little too close together for the cuffs to fit on easily - the figures' arms only move so far inward, so you'll have to stress things a little to make everything fit. 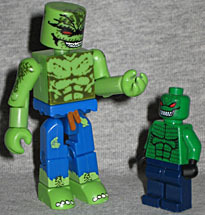 The guy who's given Batman all that battle damage is one that really shows why Minimates are far superior to Lego minifigs - Killer Croc. This scaly former wrestler looks completely brutal as a Minimate, with really detailed paint apps to convey the texture of his skin. He has four yellow toenails on each foot, and his hands are actually molded with little claws. His eyes are solid red, and his rough lips are pulled back to reveal jagged white teeth. 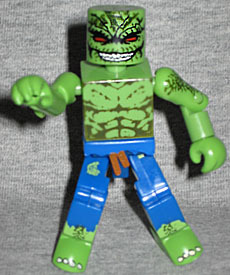 Now, obviously the articulation on this Croc is better than the Lego version. Minimates have twice as much movement as a Lego figure, so that's not even a contest. The paint is nicer, from the shade of green they chose to the way his scales are painted on. His hands are the right color, and his feet are showing out the bottom of his torn blue pants. He even has a belt piece between his hips and chest. The biggest surprise is Croc's size. He's always been a large character, and Art Asylum recognized that. 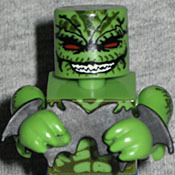 Rather than the standard 2" body, Killer Croc is one of the 2½" Minimates. It doesn't seem like a big difference, but at that size it's a lot. It's nice that the DCD license does't have the same height restrictions that the Marvel license does, but it does underscore a problem. As fans, we're going to integrate our collections. We're going to mix Marvel and DC. We're going to have the Daredevil/Batman crossover that will never happen in the comics. But size is going to be an issue, since the Marvel Minimates are held to a hard 2" limit. Killer Croc is bigger than the Hulk? He is if you go by the Minimates. It's cool that DC is willing to make bigger characters bigger, but why not save it for the truly gargantuan guys? Heck, even Minimate Darkseid is 2" tall - don't go crazy with the bigger figures, guys. If Wolverine and Colossus can be the same size, so can Batman and Killer Croc.